The world population has undergone major changes throughout its existence. However, it is about to face one of the toughest challenges never before experienced by the human race, the overpopulation of the planet. It faces a global cycle that will bring social and economic complications, visible mainly in countries with weak economies with high rates of poverty and marginalization issues. This paper focuses on the amount of food shortages, and economic impact on Mexico of one of the main alternatives taken by global organizations to counter this imminent problem: Chemical fertilizers. According to studies by the United Nations Organization, the world population in 2011 was 7 billion people. By the year 2050 is estimated to be approximately 9.1 billion people that will be on the planet. Much of this phenomenon will be led by developing countries, which suffer the height of the demographic transition and the ravages of this phenomenon will effect within 30 or 40 years. In aspects of agricultural production, according to the same UN study, is expected to meet global demands have to increase production by 70%. However, developing countries-including Mexico-will have to increase productivity by 100% in order to meet local demands. The biggest challenge in the coming years for the Mexican agricultural sector is to supply food for a growing population. But what measures must be implemented to increase the level of production in a country that urbanization reduces its surface area available for cultivation every day? Fertilizers are called to be the pioneers of this great revolution and played a significant role in boosting the productivity of crops. According to the International Association of Fertilizer Industry (IFA for its acronym in English), the global consumption in 2012 recorded a figure of 176.1 million tons, of which 61% were of nitrogen fertilizers, 23% phosphate and 16% of potash. In the same article the IFA estimates that by 2018 there will be an increase in the average annual rate of fertilizer use and consumption of 1.8%; of which 3% is nitrogen, phosphate and 1.5% to 1.9% for potassium. In Mexico, the manufacture of fertilizers wins big ups and downs over time. Since its privatization and opening to competition in 1991, domestic production remained on the rise until 1997, year in which the State has restricted natural gas. This year 2006 registered a steady decline. However, since 2007, fertilizer production has had a substantial growth. Only 2009 registered decline by the economic crisis in our country. This growth was because of the need for this product in agricultural activities and various actions taken by the government to promote this market. Fertilizers play a key role in agriculture, as these contribute to the improvement of crop productivity by providing nutrients needed for productive development . Also, with technological and scientific advances in the study and manufacture of fertilizers, industry has created new products that not acidify the soil and increase its productive life expectancy. This can raise the quantity and quality of crops, while cares floor and extends its production cycle, which is reflected in an increase in the returns to land. Mexico is a country rooted and dependent on primary activities. Although agriculture has been somewhat unprotected in recent years by the state, it has continued to be an important source of national income. According to the World Bank, the contribution of agriculture to GDP has hovered between 3 and 4% between 2009 and 2012. Moreover, it is a country that accounts for a considerable proportion of rural population. This means about 26 million people, equivalent to 22% of the national population (World Bank) live in rural areas in México, mostly living from agricultural activities. The fertilizer market in Mexico has oligopolistic structure with a tendency to perfect competition. A small number of manufacturers and dealers covering much of the domestic market and cater to millions of farmers. However, this oligopoly has not been able to meet the total demand of the country, so the competition between small and emerging companies for the residual market is becoming stronger . This structure, together with the national demographic situation and estimates of agricultural production and consumption have increased the chances of entry of new firms, since almost half of the demand in the country have to be supplied by foreign fertilizer. Firms in oligopolistic markets are characterized by positive benefits due to having market dominance. In the fertilizer sector, this has meant that new companies have entered the market. In the next 20 to 40 years, is expected to increase the demand and the market get extended, increasing the profits of existing firms and encouraging the entry of new firms. The fact that leading companies in the market have failed to supply the domestic demand can be mainly for three reasons. First, productive capacity of enterprises, yet implemented all production resources, not enough to produce 4 million tons that consumers demand. Second, the main objective of a company is unable to meet market needs, but to maximize its profits. The dominant firms in the market probably have achieved this goal without worrying about remaining demand. If companies want to increase their production levels and get higher proportions of markets would then have to invest in new production factors to avoid falling into diminishing returns. Finally, the cost of production is very high compared to the market price, i.e., the average unit cost is higher than the selling price of fertilizers. The cause of this is due to the lack of adequate technology or the high costs of inputs and raw materials, which cannot produce at competitive prices. From these assumptions it follows that companies must attract smart strategies to exploit existing and potential market opportunities presented, and thereby maximize profits and gain greater proportion of possible market. The fertilizer industry is very competitive. This is especially because the fertilizer goods are considered "commodities", i.e., the same homogeneous products with specific norms and standards of quality. The key variable in this market is price. Companies compete for sales and higher market share percentages in the residual part of it. Due to competition, the market price is close to the minimum average cost, which causes the profit margins are minimal and the amount of money that move are large. The objective of any firm in a competitive market is to maximize profits and increase market share. This can only be achieved through strategies to differentiate their product and generate competitive and comparative advantages that allow the company to achieve its goals. However, to choose the best strategy is necessary to analyze and master all aspects and phenomena that affect the industry. Energy reform is a very controversial subject from the social, political and economic points of view. However, it is a very important in the growth and economic development of the country. The entry of new private technologies will eliminate deficiencies by the state- owned enterprise PEMEX mainly, and may exploit and market as many products at competitive prices. This reform will provide access to various products such as oil and natural gas. These are important in the production of fertilizers; however, natural gas plays a vital role in this sector, which is the main input of these chemicals. How energy reform will impact the structure of the fertilizer market in Mexico? And how it will affect the life and existence of small companies responsible for supplying the residual market oligopoly? The methods carried out in this research were fully descriptive. Based on data from INEGI, FAO and ANIQ mainly were analyzed to determine the current status and predictions for the future of this market. The study was carried further from the point of view of microeconomics and strategic management. According to Peter Parenti, vice president of the National Association of Fertilizer Producers and Traders (ANACOFER), domestic consumption is estimated at 4 million tons per year, worth about 2 billion dollars. However, the supply-demand relationship is very poor in this sector. Total production in the country is not enough to meet domestic demand, as it serves to supply only a third of total consumption. In 2012, the total domestic production was 1.5 million tons; but it had to import 2.7 million tons to supply the domestic consumption. Between 2011 and 2012 a decrease of 5.9% in domestic fertilizer production was recorded. It is estimated that the main cause is the limited access and the high cost of natural gas in the country, which is the raw material to produce ammonia, and this for most fertilizers, especially nitrogen. Because of this insufficient production, Mexico has been characterized in recent years as an importer of large amounts of fertilizer. In the same period imports increased 23.8%. It has also led to a reduction in consumption of 4.5% (Table 1). Fertilizers play a significant role with regard to production costs, because they are one of the main inputs. Farmers that fertilize their land are forced to buy foreign product, most of the time at a higher price due to scarcity of the product in the domestic market and the impending import costs. Also, much of the small-scale farmers, which predominate in the country, do not have enough resources to consume fertilizer at market prices, and depend on government programs that give or subsidize these products to be acquired or purchased at a lower price. It follows that, from 2008 to 2013, fertilize only between 55 and 65% of the sown area . A.Nitrogen (ammonium sulfate, ammonium nitrate and urea, etc.). B.Phosphate (single, double and triple). C.Potassium (chloride, sulfate and potassium nitrate). 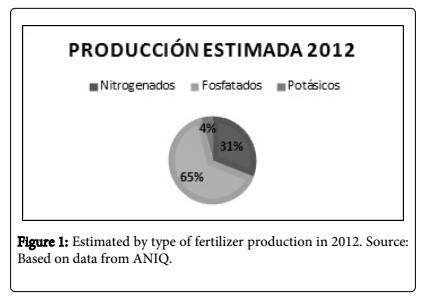 According to own calculations, based on data from the National Association of Chemical Industry (ANIQ), in 2012 increased the proportion of phosphate fertilizers with respect to the total production in Mexico, the figure reached 65%, and decreased nitrogen with 31% and 4% potassium (Figure 1). 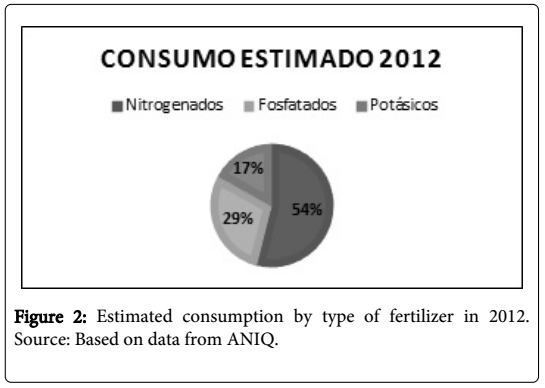 With data regarding the consumption of inorganic fertilizers, according to the statistical yearbook ANIQ, it is reported an estimated 54% nitrogen, 29% phosphorous and 17% potassium for 2012. Consumption was estimated by the sum of production plus imports minus exports. In products where it was no production in Mexico, consumption simply equal imports (Figure 2). The big difference is shown in the graphs is that since 1999 the company had closed a total monopoly of urea in Mexico, the year in which the company left this fertilizer produced in the country. This caused both the urea and ammonium nitrate to be imported in their entirety. Until 2012, in terms of nitrogen fertilizers, ammonium sulphate only is produced. 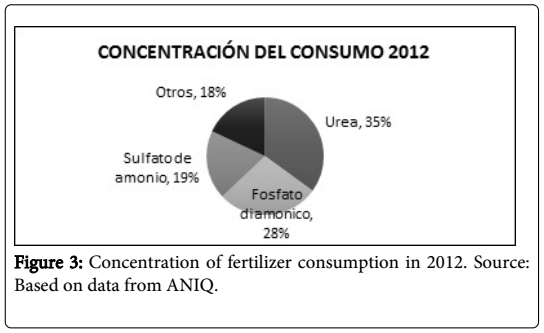 However, this phenomenon is aggravated when it is noted that more inorganic fertilizer is used in Mexico, especially urea. 2.6 million tons, equivalent to 63% of total national consumption. While behind these two, is ammonium sulfate 19% (Figure 3). According to official sources, with the entry into force of energy reform in Mexico, PEMEX reactivate the production of natural gas and ammonia at competitive prices, which plan to increase the production of fertilizers at low prices. The objective of this action is to increase fertilizer production in the country and reduce dependence on domestic consumption of imports. Natural gas is one of the main inputs for the manufacture of agrochemicals, including means the 60% of cost of production of fertilizers. Produce it in Mexico is expensive, because its exploitation with the existing infrastructure represents very high costs. In addition, all the production does not cover the total demand. Therefore, it has to rely on imports, which amount exceeds one third of the total consumption. Energy reform will allow the insertion of the national and foreign private business in the exploitation and marketing of natural gas in the country. Thus, class technologies will be used to obtain the raw material at the lowest possible cost, and thus to produce fertilizers at low and competitive prices. With more companies in the market, both in the production and distribution of natural gas, this will offer as many products at lower prices; which is always beneficial for consumers and for manufacturers of fertilizers . fertilizer consumption and reduce the quantities imported . However, energy reform not only brings good news, also cause great threats in the fertilizer sector. The bad news came when PEMEX Announces Purchase of plant- Nitrogenous Agro Pvt Ltd. for an amount of 475 million dollars. This company, located in Veracruz, was a monopoly of urea in the country, as it was the only producer of this fertilizer. Its production figures reached 3000 tons per month of this product between 1992 and 1994. However, with the signing of the Free Trade Agreement (NAFTA) in 1994 America, the company survived for only five years. It could not compete against U.S. fertilizer and closed its doors in 1999, coupled with PEMEX ammonia supply stopped due to debts in millions of the company. With this decision, Mexico stopped producing urea importing 100% of national consumption. The acquired company by PEMEX is 15 years stopped with old, worn and perhaps useless machinery. And if it worked would be the same, since their technology is obsolete for the production of fertilizers today. So, according to PEMEX, it will have to make another major investment of $ 200 million to rehabilitate and operate the plant. It is planned that the entire process is accomplished in 15 months. Once upon completion of Agro-Nitrogenous operations, PEMEX estimates to revive production of 900,000 tons of urea annually. This represents about 75% of current national demand for this product. This level of production could replace over 400 million dollars per year corresponding to imports. With this decision, PEMEX and Agro- Nitrogenous sum up with enterprises to practicing oligopoly added the fertilizer sector in Mexico, reducing to some extent the residual market for small producers. Many of these small companies that planned to start production operations after energy reform and the decline in the price of natural gas will be limited to continue importing the product and struggle to survive in the market, since large firms are those that largely dominate production activities. It is interesting to observe how they will react on the market leaders of the imminent entry into enforcement of the energy reform. It will be able to supply domestic demand with local production, and small businesses will only survive as distributors? Or does a residual market will continue to exist even after the energy reform to allow small-scale enterprises producing fertilizer? Let recall that the demand in this sector will sustain increased rates remaining constant over the next 30 or 40 years. It is likely that rates of market growth and demand have a rate faster than the supply and production itself. Medium and small businesses could afford to invest in plants and reactors for the production of these agrochemicals. However, returns to scale favor large companies due to the volume of their production. As mentioned above, the key variable in this sector is the price. Therefore, strategic alliances between small businesses are ahead, seeking to share technology and capital in order to buy reactors and perform better production together to minimize production costs and to have the ability to manufacture at competitive prices. Surely, leading companies will increase their dominance of the market with this reform, so that competition for survival in the residual market will be relentless. The phenomenon of new entrants will be completely reversed, and that will begin to lose its benefits to be negative, which will cause the output of many firms. A pretty nice strategy for small businesses is the formation of alliances between them. A strategic alliance is a voluntary agreement between two or more firms that involves exchange, combine or jointly develop goods, services or technology . To confront the individual market will be very complicated, so that cooperation is a good start. By combining resources and technology, companies will be able to reduce production costs and maximize profits, which will have higher profit margins and faster growth. However, companies face a widespread social problem worldwide: Cooperation and opportunism. Forming alliances is not so simple, and less for companies that are playing their capital and survival. Most partnerships are dissolved by opportunistic practices of its counterpart, which has generated a feeling of unease and discomfort with these cooperation strategies. However, they are still a good choice, and in this specific case, apparently is the most viable. The partnership and cooperation between these firms is a credible threat that may favor the durability of the alliance and subtract incentives for firms to deviate from the strategy. Whether a company decides to break the agreement, would jeopardize the invested capital and market like this can mean the demise of the firm. Energy reform will bring consequences that will directly affect many Mexican industries. One is the market for chemical or inorganic fertilizers. With the entry of new private sector technology, exploitation and production of natural gas will increase. This will increase domestic production, reduce imports, increase consumption and decrease prices of agricultural foods. However all is not hunky-dory. From a microeconomic point of view it can be predicted that this reform will benefit big business and hurt small ones. The existing oligopoly will become stronger and will cover more market share, bordering to getting small business out of competition. Furthermore, the strategic interaction will lead companies endangered to take action in an effort to compete for the residual market oligopoly and seek to increase its market concentration. Some of these measures are strategic alliances and collusions, where they combined capital and technology resources in order to maximize profits and minimize costs and stay firm foot in the competition.